The Oconaluftee River Valley lies at the mainentrance to the Great Smoky Mountains National Park on the North Carolina side. The name of this beautiful valley means "by the river" in Cherokee, and was known by American Indians to be a place where people and animals came to heal. Today this river valley is part of the Oconaluftee Archaeological District, on the National Register of Historical Places, and is part of a federal preserve. In the late 1700s John Jacob Mingus, the son of German immigrants, was the first European to settle in the valley — and the first settler in what is now the Great Smoky Mountains National Park. 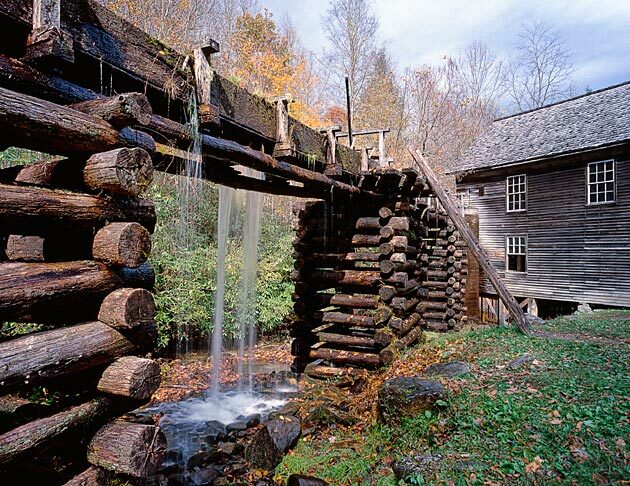 If you're interested in mountain culture, there's no better place to immerse yourself in the experience than the Mountain Farm Museum and the Mingus Mill. Today you can tour the ten historic buildings of the Mountain Farm Museum, including the Mingus Mill, which is still in operation. A water turbine that relies on water flowing downhill powers the mill instead of a traditional water wheel. This open-air museum is just a half a mile from the Visitor Center and includes a house, barn, apple house, springhouse, smokehouse, and more. The Davis House is of particular interest. Note that it's built of American chestnut, a tree that was decimated by the chestnut blight of the early 20th century. John Davis built this house himself without the aid of a sawmill, and he did it in just two years. Also of interest is the springhouse, the pioneer version of a refrigerator with water in the door. Springhouses are built over cold mountain streams, and the chilly mountain water keeps the interior of the small structure at a consistent low temperature. This building kept the family's water supply clean and free of debris, and it also provided a safe, cool place to store perishable food. There are two beautiful and easy walking trails that start near the museum. One follows the Oconaluftee River and the other takes hikers past old farms and into the Smokies. The Mountain Farm Museum is just 30 miles from Gatlinburg and is a wonderful way to spend a day in the Great Smoky Mountains. Bring a picnic and your camera — you'll want time to linger in the historic gardens and to learn about pioneer agriculture and animal husbandry practices. Kids can visit the blacksmith shop and make their own dinner bell, and visit the Drover's Barn, an old-fashioned hotel for animals. The beautiful new Visitor Center is an attraction in its own right and offers restrooms, air conditioning, and a self-guided tour through a museum that was 60 years in the making. There's no better way to enjoy some peace and quiet than renting a cabin in the Great Smoky Mountains. Spend a day learning about the history of this beautiful and unique place, and you'll come away with a new appreciation for simplicity and a fresh perspective on modern life.